Hi all! 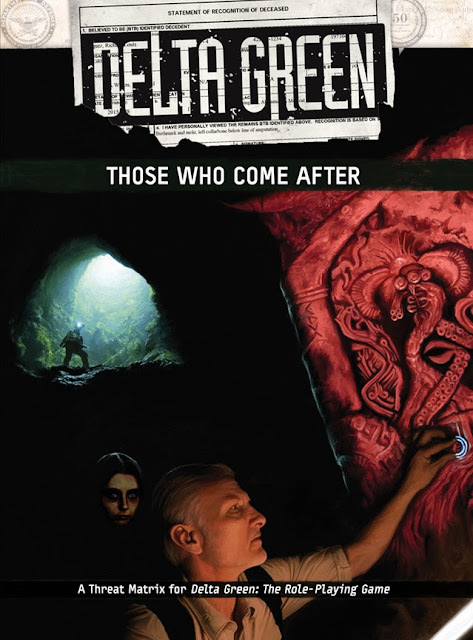 Today I have an interview with John Scott Tynes on Delta Green: The Labyrinth, which is currently on Kickstarter! I pushed John on a few things I'm curious about with the game so I'm excited to share the answers below! Notes: Mental illness and its handling in horror and cosmic horror media, including Lovecraft, is discussed in this article, as well as the general topic of inclusivity in this type of horror media. Also, John uses the term "savages" in quotation marks in this, referring to the stereotype of "savage" people in historical media. This use does not intend to validate any racist perspective, but is used in context of the fiction being discussed. 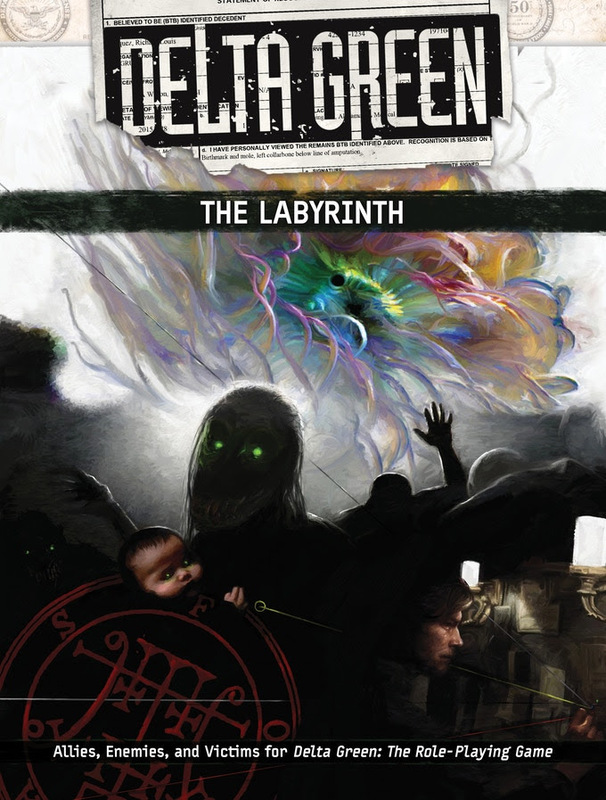 Tell me a little about Delta Green: The Labyrinth. What excites you about it? I love building new worlds and new mythologies. When we took twenty years of Delta Green sourcebooks and fiction and brought them all forward into the present with Delta Green: The RPG, we wrapped up and killed off nearly all of our old enemies. Villainous groups like the Fate, the Karotechia, and Majestic-12 really defined the classic era of Delta Green, but it was time to wipe the slate clean and start fresh. The Labyrinth is where I'm rolling out a whole new set of enemies that will define a lot of Delta Green campaigns for the next decade, and that's incredibly exciting. The new enemies I'm designing aren't just targets in a shooting gallery. They're in it for the long haul and they have their own story arcs to work through as your campaign continues. Each group has three specific stages of growth or change they go through in response to the actions of Delta Green. Just as an example, and I'm going to avoid spoilers here by not using any names, there is a nefarious group I've designed who on the surface don't seem too terrible. They have horrible origins, and long term they're a huge problem for humanity, but they're not trying to blow up the White House or whatever. Yet as Delta Green begins to tangle with them, the group reacts. First they start securing everything they're doing to avoid detection. Then they start hiring muscle to defend themselves and even proactively try to assassinate the Agents. Finally, if Delta Green is still hitting them around the world, they launch a crash program to train large numbers of their members as sorcerers and dramatically escalate their supernatural power. In other words: because Delta Green attacked them, they actually become more villainous and more powerful than if they'd been left alone. But if you leave them alone, then long term they're a huge problem for humanity. That's the approach I'm taking as a game designer. When the players try to solve these problems, they will generally make the problems worse before they can make them better. I think that's a much more interesting and dynamic way to think of enemy organizations and one that really lends itself to campaign play. It also ties directly into some of DG:RPG's key mechanics, where the more time you spend as an Agent, the more your own connections to life, family, and home corrode and fall away. And the book isn't just enemies. I'm also designing a bunch of groups who can be allies. But as with the enemies, the allies also go through three stages the more they interact with the Agents. So a character who starts out really helpful may eventually turn on you, or let their life fall apart because they buy into your crusade, or they may endanger themselves and others because you haven't actually told them the truth about the dangers they're facing. Over time, you'll see these allies rise, suffer, and fall -- or even become your worst enemies. And finally, I'm excited that The Labyrinth is all about America. Delta Green has always resonated with the mythic American themes of sheriff and outlaw, the civilized East and the wild West, and the power of the government versus the freedom of the individual. But today we're seeing more schisms, more oppression, more prejudice in this country than I've seen in my lifetime. It feels like we're tearing at the seams. And it's those conflicts and those tensions that are driving my thinking with this book. I want to capture what this country feels like in 2018 and transmute it into inspiration for a new generation of tabletop storytellers to shape in their own directions. When you talk about capturing this country in 2018, how are you approaching that? The US in 2018 is volatile, and hard for a lot of people. Fundamentally, Delta Green is in the horror genre. That means that for any avenue I explore, I end up looking for a particularly horrific version of it. That doesn’t always mean monsters and cultists, however. In some cases it’s the horror of a good person who starts falling apart. In other cases it’s a completely non-supernatural situation that is nonetheless genuinely awful. Horror is by its nature triggering. What I work to avoid is being exploitative. As much as I love the horror genre in principle, in practice I have little interest in most horror media. So much of it repeats the same tropes over and over and often in ways that feel deliberately, even leeringly exploitative. There’s a thread of horror creators who seem to take joy in the depiction of suffering or degradation, who cross a line between shining a light on the dark corners versus snuffing out that light to entrap and even victimize the audience. I’m writing some horrific material, but I really work to come at it from a perspective of humanity. I want the reader to be not simply triggered, but moved. Fear is a powerful emotion, but at the end of the day I can do a better job of scaring you if you’re emotionally engaged by what you’re experiencing. As for America in 2018: the news regularly outdoes my best efforts as a horror writer. I could never outdo the wretched things humans actually do to each other every day. What I want to accomplish with this book is to take some of those situations and agendas and put them into a fictional framework that challenges the players. I want to give them hard problems, even human problems, and see how they respond. I want them to question the society they live in and even the narrative structure they’re playing in: because as much as Lovecraft’s Cthulhu Mythos is presented as corrosive to those who encounter it, the same can very much be said for Delta Green itself. As a creator, my own creation has things to answer for. What themes are you engaging with, and how are you addressing your own potential blind spots? My work is largely intuitive rather than planned. I get the kernel of an idea, I start drafting, and I usually can see just far enough ahead to steer in the right direction. This means themes tend to emerge organically. To some degree I learn what I was writing about in the rear-view mirror and then it’s in the revision process that I flesh out what has emerged and shape it into coherency. At this point in the project I’d say that an emerging theme is embodied in the ancient Roman question, “Who benefits?” When you look at any conflict in American society and study the actors involved, that question can illuminate their motivations. Who benefits when women are bullied? Who benefits when the right to vote is eroded? Who benefits when nascent social norms are opposed and rolled back? The question of blind spots is a good one. I’m a middle-aged cis male caucasian and I surely have them. Life experience is part of the answer. I have made my own journey — bumpy at times — into greater understanding and awareness of how multifaceted humanity is and that happened because of many different people and moments in my life. When I create characters for this book, I take time to think about each one: where they’re from, their family’s culture, their perceived race and gender. I’m not trying to tick boxes on a checklist but when the fictional context coincides with a particular character trait and some kind of frisson occurs, I go with it. In college I got my degree in journalism and my first step with nearly any idea is simple: do the research. For my 1999 novel Delta Green: The Rules of Engagement I interviewed several people including a staffer at the Ft. Leavenworth military prison and a random guy I found online who’d recently taken a vacation to Vieques Island. I think the most fundamental trait any writer needs is curiosity. The more you want to know about the world, the richer and more diverse your writing can be and the likelier you are to fill in your own blind spots. And we live in a golden age for satisfying our curiosity. In the current chapter, I have a female character whose parents moved here from India before she was born. I wanted her to grow up in a mid-sized American city and Tulsa, Oklahoma, came to mind. So then I wondered what life was like for Indian immigrants there and an internet search led me to the India Association of Greater Tulsa. My conception for her character blossomed the more I learned and curiosity is what drove me. In what ways do the enemies and allies in The Labyrinth differ from earlier Delta Green work, narratively and in inspiration? Delta Green’s original antagonists were great but also fairly straightforward. I mean we literally had Nazis you could go punch! Plus sinister government conspirators and evil occultists, all straight out of the villain playbook. We did great things with them and we brought a lot of historical context and creative juxtaposition to the table, but that was twenty years ago. When I look at the world now, I have to see the Cthulhu Mythos not as an end but as a means. Why would someone start worshipping a tentacle god? “Because they went insane!” is just not a good enough answer for me anymore. Everyone wants something — who benefits? — so when I look at the supernatural in Delta Green I ask how people would exploit it, not just worship it. Even so, those kinds of rational motivations only help you understand how people start exploiting the Mythos; on a long enough timeline, they really do go insane and howl at the moon because that’s Lovecraft’s universe. But these days I’m much more interested in that early phase, when they have one foot in the unnatural and one foot in the mundane and you can still see the terrified human behind the mask of insanity as the door of reason closes on them forever. The concept of insanity is one I often get curious about with games, as a person with bipolar disorder and PTSD, both of which often get made into a mockery. How do you write about these kinds of cosmic "insanities" - minds overwhelmed by some supernatural force - without sounding hackneyed, and without repeating previous work you've done for the game? Unlike a novel, in game writing we mostly deal with externalities. We don’t typically get into inner monologues or thoughts or even much dialogue, so the usual ways writers depict mental issues in fiction don’t come up. Instead we rely on actions, agendas, and backstory to communicate character and that is where, in Lovecraftian gaming, we express our ideas about the mental states caused by exposure to the supernatural. Fundamentally, the mental issues Lovecraft described were what “normal people” experience when their rational minds encounter the supernatural and experience an existential crisis that challenges their religious faith, their sense of the natural order, their belief in humanity’s primacy, and their logic and reason. At the climax of “The Rats in the Walls,” for example, the narrator’s discovery of his family’s ancestral secrets causes him to regress to a wild, primitive, and cannibalistic state. But it’s noteworthy that Lovecraft does not necessarily treat his cultists this way. Wilbur Whateley in "The Dunwich Horror," for example, is a half-human child of an Outer God and a human cultist mother, but he has no serious problems checking out library books or navigating human society. Herbert West, while not exactly a cultist, is a classical mad scientist but is fully functional and even rational in his extreme experiments. The unnamed cultists around the world in “Call of Cthulhu” are presented as typical “savages” — dancing around bonfires, conducting sacrifices, that sort of thing — and are probably the closest to the RPG's conception of madness in this sense. But I believe their behavior is presented more as a cultural phenomenon, the result of their secluded upbringing and indoctrination, rather than madness per se. I think where Lovecraft was coming from was that ordinary people who experience this kind of crisis may break down, but those who have accepted the truth of reality can live their lives even if they’re unusual ones. The Whateleys are doing just fine. And even some ordinary people, such as Doctor Armitage, can challenge the supernatural and emerge intact through force of will. When Chaosium first created the Call of Cthulhu RPG, they took Lovecraft's “Cthulhu makes you crazy” idea and applied fifty years of psychology to present a diverse array of game-able mental problems that went far beyond the general hysteria or depression Lovecraft evoked. Of course, they were generally neurotypical designers writing for a hypothetically neurotypical audience and weren’t necessarily considering the reaction of people who fall outside that range. Our Delta Green RPG’s focus on Bonds is, I think, a more productive approach for the future. You can stay away from the cliches of diagnoses but still demonstrate the trade-offs our characters make in this fictional context between home and work, family and obsession, socializing and isolation. We didn’t jettison the old Sanity approach by any means, but Bonds are a narrative way of expressing the fundamental corrosion and I think a more frequent and meaningful tool at the table. With The Labyrinth, I’m not concerned with specific labels or diagnoses. When I write of a character who is slipping into obsession and madness, my interest lies in how this impacts their life and what it means for the Agents who have to deal with the consequences. From a narrative perspective, that’s much more useful and interesting than declaring that a given character has Borderline Personality Disorder, for example. I'm really interested in the stretch goal with props! How do you plan to create those props and interesting bits and pieces? How do they integrate with the sourcebook? The Labyrinth is a sourcebook, not a set of adventures, so it’s somewhat unusual to create handouts for it. But my hope is that for many Handlers, the Labyrinth will infect their campaign and even hijack it. The characters you meet from the book have their own agendas and arcs, and even when the Agents aren’t thinking about them, they’re thinking about the Agents. And every organization in the book has connections to several other organizations, so once you enter you can really go in all kinds of directions. Our hope is that the handouts will transform the Labyrinth’s organizations into an organic, dynamic campaign that just goes even if the Handler isn’t using a prewritten scenario for a given session. They will provide clues and connections that can lead from one group to another, introducing more characters, opportunities, and challenges. Ultimately, I’d love for a gaming group to have a corkboard covered in Labyrinth handouts with push pins and strings connecting them together so that their friends and family wonder: are they totally losing it? Thank you so much John for such a fun and informative interview! I hope you all enjoyed the interview and that you'll check out Delta Green: The Labyrinth today on Kickstarter!